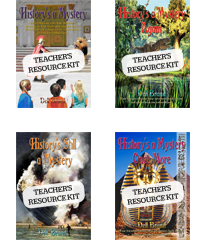 These comprehensive teacher resource kits are geared to Stage 3 learners (Years 5 & 6), although advanced Year 4 and many Year 7 students will also find the worksheets interesting and challenging. The worksheets extend each adventure over a wide variety of subject areas, so teachers can readily choose an activity most suited to their class at a particular time. The Technology page attached to each adventure allows students to research more information using the internet or library books. Individual Chapter Worksheets are also available through Teachers Marketplace.